Hello everyone, Olivia here. Today I’m marking a sad anniversary. Back in January I barked out about a Dog in the United Kingdom named Sky. Just to remind you, Sky was taken from her family simply because of her appearance. She would have been euthanized if not for her family launching a legal battle to get her home. Sky has now been locked up for a year. That’s a very long time to be away from your family. Especially in dog years. Sky’s family did win a decision in court to have her exempted & sent home, but that decision has been legally challenged & so Sky is still not where she should be, at home with her family. The BSL (breed Specific Legislation) has been on the books in the Untied Kingdom for 26 years. That’s just wrong & backwards. A dog is a dog. There is an online event this week to help Sky & raise awareness of the evil BSL. 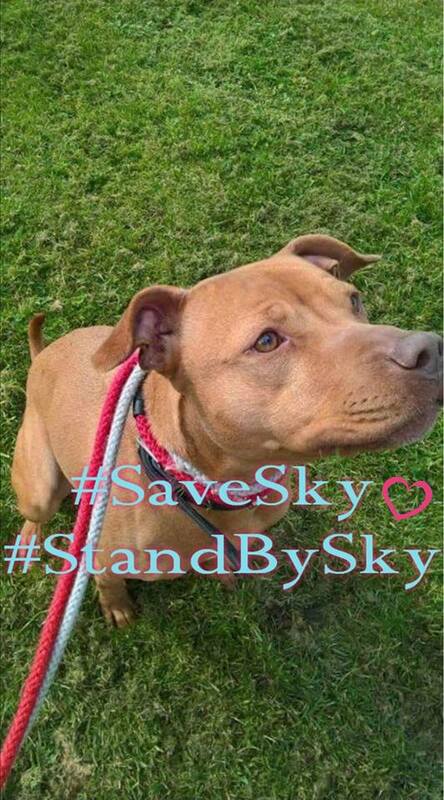 You can get involved & perhaps play a small part in getting Sky home with her family. You can also sign a petition on Sky’s Facebook page. Please help bring Sky home & end BSL everywhere. We agree! BSL is stupid, nonsensical & ineffective. Paws crossed and shared on both Twitter and Facebook. Stay brave, sweet Sky! BSL is stupid, nonsensical and also ineffective. Oh no!! That is so terrible. I can’t even imagine what that would be like…my humom has to be very careful about my behaviour in public because we never know if someone will try to report me even if I’m not doing anything wrong!! I hope Sky will be able to be reunited with her family. The fact that you & your huMom need to be fearful for your safety makes us very angry. A dog is a dog!